The cast-iron buildings and cobblestone streets of Tribeca hearken back to this neighborhood’s industrial past. They also provide the perfect home for galleries, performance spaces, and funky shops. While there is plenty going on here, the mood is more relaxed and the atmosphere is almost quaint. The famous Tribeca Film Festival, one of the cultural highlights of the year, is close to home for many celebrities who find a peaceful haven in this corner of the city. The three performance spaces at the Tribeca Performing Arts Center offer a rotating selection of dance, music, comedy, children’s theater, and more, as well as many workshops. Some of New York’s finest artists open their workspaces to the public during the annual Tribeca Open Artist Studio Tour. Home design, fashion, and quirky shops of all kinds dot the neighborhood. The Greenmarket, on Greenwich Street between Chambers and Duane Streets, is a popular gathering place every Saturday and Wednesday year round. Along Tribeca’s magical streets are some of the top restaurants in the city. While not as wild as some other neighborhoods, late-night partygoers can always be found in the popular bars of this small enclave. Hudson River Park affords fabulous views of New York Harbor, the Statue of Liberty, and through the Verrazano Narrows Bridge out to the Atlantic. Besides plenty of green space, its facilities include tennis, skating, basketball, beach volleyball, field sports, miniature golf, and a playground with seasonal water features. A mooring field, sailing school, and community dock expand the park out into the water. Smaller parks are sprinkled throughout the neighborhood. Within the meticulously restored warehouses and commercial spaces that line the landmarked blocks of Tribeca, unique light-filled loft spaces abound. The only neighborhood that rivals Tribeca for this type of housing stock is Soho. There are also towering high rises full of amenities. 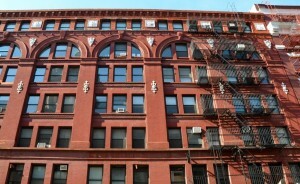 The neighborhood appeals to families, artists, and professionals who want to live near work in the Financial District.